Brugal is the world's third largest producer of rum, ranking behind only Bacardi and Captain Morgan. In the Dominican Republic, if you're drinking rum, you're probably drinking rum from Brugal. The Brugal family inadvertently started the movement for entrepreneurship in the Dominican Republic when Andrés Brugal Montaner settled in Puerto Plata on the northern coast of the island and started a small rum distillery in 1888. Today tourists travelling to Puerto Plata can tour the Brugal facilities there, where the family still ages, blends, and bottles their rum. The distillery, however, moved from Puerto Plata to San Pedro de Macoris on the southern side of the island. According to Brugal, this move was to help preserve the resort experience in Puerto Plata after it was discovered that the process of producing rum was having adverse effects on the local environment. The protection of the environment has since become a significant part of Brugal's operating strategy in the Dominican Republic. While the aging and bottling operation in Puerto Plata is open to the public for daily tours, the distillery on the other side of the island is not. I was fortunate enough to be invited to tour the distillery by Brugal. Brugal's rums are molasses-based, made entirely from molasses created using sugar cane from three nearby provinces in the Dominican Republic. Every day, trucks deliver molasses to Brugal's storage tanks, which can hold up to 1 million gallons of rum's basic raw material. The molasses from these tanks is then pumped into six fermentation tanks with water and yeast to create “molasses wine,” with about 7.5% to 9% alcohol by volume, which can be distilled into rum. The fermentation process takes no longer than 32 hours to create the wine, and is managed by only three workers per shift. After fermentation, the molasses wine is run through Brugal's two column stills. The double-distillation process removes the vast majority of congeners and other heavy elements from the alcohol, leaving only a very light, clean distillate at roughly 95% alcohol by volume. This lighter body is very common for “Spanish” or “Puerto Rican” style rums. At this point, Brugal's focus on the environment begins to come into view. After distillation, the waste materials are high in organic compounds and cling to the inside of the stills. This waste material, comprised of leftover yeast, unfermented sugars, and molasses residue, is flushed out of the stills and into large “digesters” or containers which are used to break down the waste. 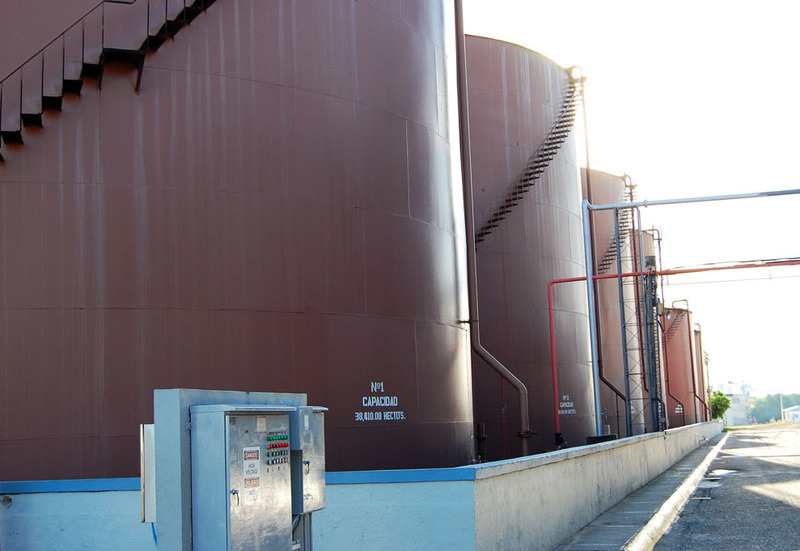 For the past 14 years the methanol and remaining ethyl alcohols are collected as the waste is broken down using a proprietary process, resulting in a bio fuel that Brugal uses to maintain its everyday operations. At present Brugal's recaptured waste is providing 50% of the fuel oil used in the steam production for its stills. Plans are currently in place to expand upon this program and push that percentage even higher and even further reduce the potential environmental contamination from the waste. Tests are already underway, with Brugal hoping to be able to eliminate 99.5% of their waste and leave nothing but clean water and fertilizer for the sugar cane as their production by-products. Matt Robold is a rum connoisseur and insufferable snob who enjoys subjecting the world to his views at RumDood.com. He sits on the Board of Directors of the Cocktails & Spirits Online Writers' Group, a collection of writers dedicated to helping the world drink better. Matt lives in Southern California with his collection of rums and an abusive mint plant.